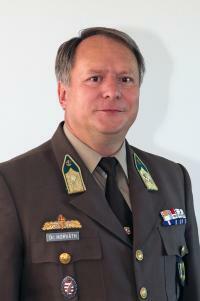 Colonel Horváth has served in the Hungarian Home Defence Forces as a combat engineer officer since 1986. He graduated from the Budapest University of Technology and Economics. He worked within military higher education and with troops and different higher commands. Colonel Horvath has taken part in military missions in various operational areas (FYROM, Croatia, Afghanistan). The objective of the Institute of Military Leadership Training is to conduct high quality military leadership training at both bachelor and masters levels for the Hungarian Home Defence Forces, and to conduct research and development in all issues related to the employment of military forces in the framework of national and NATO-EU relations. Major R+D activities: many university teachers of the institute take part in different individual and joint EU and national scientific projects, for example in the so called Social Renewal Operational Programs. Main international partners: the General Tadeusz Kościuszko Military Academy of Land Forces in Wrocław; the Armed Forces Academy of General Milan Rastislav Štefánik, Liptovský Mikuláš, Slovak Republic; the University of Defence, Brno, Czech Republic; and the Joint Air Power Competence Centre, JAPCC Kalkar, Germany. The mission of the Department is to educate officers and to conduct research on defence management, on the development of military strategy and strategic-level operations in the past, at present and in terms of what is expected in the future. Professors and lecturers of the Department focus on the theory and practice of modern military operations and the domestic system of national defence. Areas of Sciences related to the activities of the Department include: the development of military strategy; the development of military theory; the theory and practice of today’s military operations; general theory of military science; defence management; domestic system of national defence. The Department of Military Leadership and General Subjects is responsible for education and research into leadership and related fields. The Department believes that leadership can be learned. We prepare students to become effective organisational members of the 21st century environment of complexity, change and unpredictability. The education provided by the Department covers all academic levels. The Department also promotes interaction between research and education. Our staff focus both on publishing their work in top academic journals and on being able to communicate this through their teaching. The main mission of the Department is to conduct research and to teach military history from ancient times up to the modern era. Another important task is to teach the military related areas of philosophy and cultural history. The Department contributes to all levels of education at NUPS from BA and MA to PhD and staff officer courses. Our colleagues deliver comprehensive and up-to-date knowledge for prospective military and civilian leaders. Colleagues regularly publish the results of their research in significant Hungarian scientific journals (i.e. Military Sciences, AARMS, Journal of Military Sciences) and apply them in the education they provide. They participate in numerous scientific conferences organised in Hungary and abroad as well. An important task for the Department is to support talented students’ in their scientific work. Colleagues regularly tutor students, assisting them in preparing their scientific competition papers. The mission of the Department is to prepare and train cadets and officers to carry out their tasks in general and special fields of military intelligence, field artillery, air defence artillery, military and combat engineering, military geography and mapping, land navigation and CBRN defence. At present, the Department has got 6 special subgroups for managing these distinct tasks. Areas of Sciences related to the activities of the Department: significant results, such as supporting live-firing artillery exercises; participation in international education cooperatives; organisation of various conferences and symposiums; leadership of research areas in PhD education and maintaining extensive publishing activities, were achieved in the field of combat simulation systems (TOPCIS), military engineering, security geography, CBRN defence, environmental security, security technology, the application of and maintenance of air defence artillery command and control systems. The mission of this Department is to educate officers and to conduct research on defence management, the development of military strategy and strategic-level operations in the past, now and in the future. The professors and lecturers of the Department focus on the theory and practice of modern military operations and domestic systems of national defence.